Thank you so much to everyone for the well wishes and for all the great advice from all you Moms out there! You all made me feel so much better! My emotions got the better of me, not to mention those darn harmones!! I'm sure I will have more than enough love to go around! And, I know Antonio will make a wonderful big brother and he is very excited to share all his Thomas trains with his sibling!! If it's a girl, she better like trains! LOL Boy, do I love that kid!! Today I thought I'd share some projects that I had made for some Dirty Dozen work over at SCS back in August. The theme was "Back to the Drawing Board". We could make things regarding school or office and/or incorporate school and office supplies in the projects. One of my favorite classes in school was Home Economics, specifically Sewing. So I made this cute little sewing box. I covered a wooden box with some Autumn Leaves paper and then "painted" some wooden spools that I found in AC Moore for like 25 cents each with some Shimmerz paints. 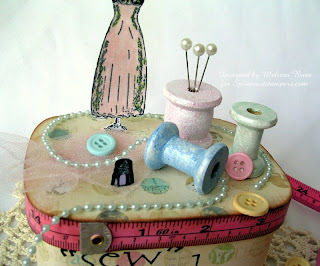 I then added some Inque Boutique/Darice stamps, a piece of a measuring tape, buttons, tulle, pearls and stick pins. Here is a fun card that I made with some Cosmo Cricket dp, IB stamps, Melissa Frances rub-ons, some felt and a real piece of chalk. This could be given any time of year to your favorite student after they get that A+ on their test! And here is another School card with a vintage look. 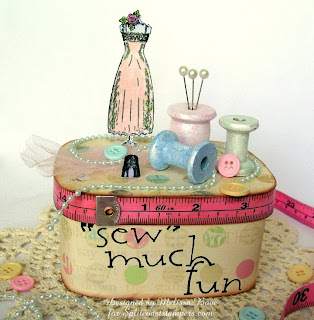 It uses some fab stamps by Pink Persimmon, a Melissa Frances rub-on and the cover from a mini Composition book. Hi Everyone! First off, I want to apologize for being "missing in action" for so long!! The move was more work than I could ever imagine! I so appreciate all the warm well wishes that we received! I am never moving again!! LOL And thank you very much for the Birthday Wishes I received last week! You are all very sweet to have even remembered my birthday! Thank you so much again! Well, this year has certainly started off with a bang! We moved into our dream home and then shortly before New Year's we received a LATE Christmas gift! Late being the keyword! 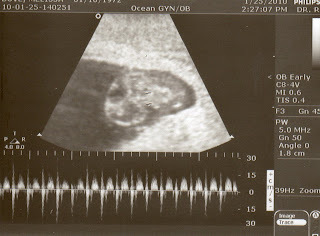 Yup, I am pregnant with our 2nd child!! We are thrilled, excited and still in shock! It took me 2 1/2 years to get pregnant with Antonio, so this was kind of a surprise! I guess with worrying about the move, getting our new house livable, on top of not selling our other house (thankfully, we are renting it out), and throw in the Holidays, I guess I had no time to worry or think about getting pregnant! So that is my good news! The bad news, is that I haven't had time to craft in almost 4 months! Can you say withdrawals??!! My hubby is going to help me get my new studio up and running sometime in the next week. So I should be back with some new creations very soon!! I can't wait!! And I also hope to get back on some of my DT's too! Boy, have I missed all of you!! I also want to apologize for not having the giveaway that I had promised you all back in October! But I will have a HUGE giveaway to make up for it, really soon! I promise!! So lastly, I will leave you with a pic of our newest family member! LOL My almost 4 year old son, Antonio, came with me to this doctor's appt. He heard the heart beating and was so excited! As he looked at the monitor with his brother/sister on it, he smiled and then turned to me and said "Is the baby coming out now?" LOL I wish! I have been feeling horrible! But it's all worth it, right Moms?! One thing before I leave you! Is it normal to feel guilty that I am bringing in another child every time I look at my son? I feel like I am taking the spotlight/love away from him! Your feelings/thoughts would be appreciated! Until next time, have a wonderful day! !